A kitchen makeover on a budget can be a challenge! Updating a kitchen has always been a top method to raise a property’s value and helps to attract potential buyers. But it does not mean that you need to spend a fortune to prepare this room when selling. Low-cost home improvements such as painting the walls, updating cabinet hardware and lighting can really go a long way in refreshing your space for less. We point you some ideas that will help you do a kitchen makeover on a budget. Start a kitchen renovation project without first setting up a budget and you may end up spending a lot of money on all sorts of unnecessary options and additions you were not counting on. While it may not be a concern if you are planning to stay in the house for few years, but if you are likely to move out soon, it pays to limit your spending. Do some research into local home improvement costs online, or go to your local home improvement store and price out fixtures, materials, etc.. Determine how much you can DIY (do it yourself) and how much you would need a hired contractor to do. This will help you create a realistic kitchen makeover budget. When setting the budget for renovation, take your neighborhood into consideration. If you put a high-end kitchen in a middle-class neighborhood, you are likely to lose money on your investment when it’s time to sell. The same is true if you have an affluent neighborhood and you remodel with sub-par fixtures and amenities, you will most likely be passed over to neighboring homes on the market. A fresh coat of paint on walls, cabinets, and ceilings can really make a world of difference in giving your space an updated look. In fact, painting is one of the most effective, quickest, and budget-friendly options to give your kitchen a facelift. Stick with neutral tones as they offer an excellent backdrop for decor. You can also use bold colors in small amounts like an accent wall or for accessories to create interest. Just make sure to use quality paint to ensure that it goes on easily, covers well, and is durable. Need help choosing ​the right paint finish? Here're painting tips to help you decide. With a limited budget for kitchen renovating it’s important to make the most of the little things. Kitchen decorating ideas will help you stage your home for buyer appeal. Begin by de-cluttering the cabinets and clearing the counter space. Store the items that cause visual clutter. Put together frequently used items in a woven basket or a tray, prop up some wooden boards on the counter or wall-mount a few pot racks and display pantry items in an organized fashion. Use good lighting to brighten up a kitchen and make it look bigger. A mirror on the kitchen wall or a mirrored backsplash is a great way to reflect light. A very affordable way to revamp your kitchen is by updating the cabinet’s hardware. Popular options such as vintage-look glass, matte nickel, or burnished bronze can quickly and easily make dated cabinets look new. Another recommended update is to replace sink faucets. They come in a wide variety of finishes and styles, making it easy to coordinate it with your kitchen decor. Lastly, changing kitchen countertops is a great way to change its appearance. If yours are cracked, stained, or dated, consider replacing them with the new ones. 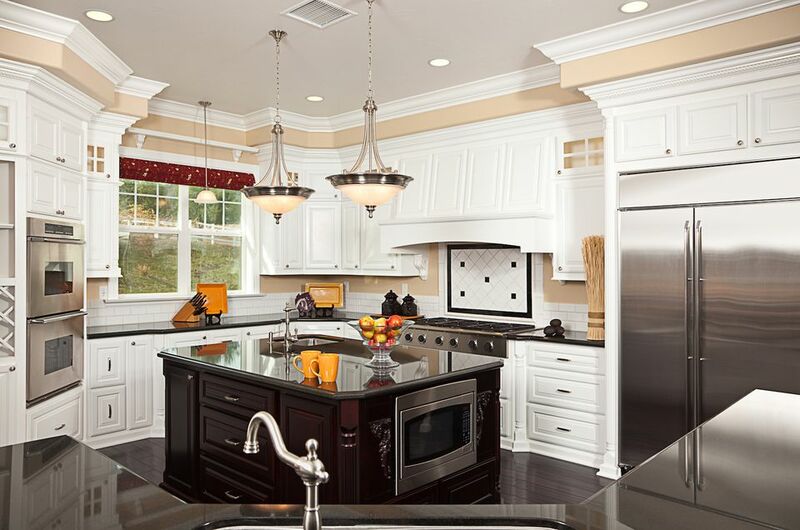 Whatever you choose, laminate, granite, or quartz, these days you can find a finish that suits your style and budget. Consider visiting thrift shops and salvage shops that specialize in reclaimed materials and finishes from old buildings for a discount on fixtures and hardware. When it comes to a kitchen makeover on a budget, the options are endless. Whether you choose to do just one or all, these updates will breathe a new life into your outdated kitchen for much less than you might expect. However, the most important tip that does not cost a thing is to thoroughly clean the cabinets and countertops. Spotless, clutter-free kitchens simply look and feel better, and at times it might be the only change you need.